The Irish Dominican friars have 19 men in initial formation. Bros Greg Daly and Neil Fox, both from Dublin, who were clothed in the habit of the Dominican Order. The Irish Dominicans are rejoicing over the continued flow of vocations to the Order having just received two new novices while another four men have just made their first professions. At St Mary’s Dominican priory church in Pope’s Quay, Cork on 14 September, Greg Daly and Neil Fox, both from Dublin, were clothed in the habit of the Order during a celebration presided over by the prior provincial of the Irish Dominican friars, Fr Gregory Carroll OP. 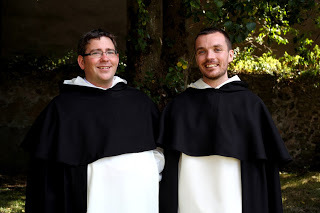 Both new novices now begin their year-long novitiate in Cork as they continue to discern their vocations as Dominican friars. Next day, in the same church, Brothers Matthew Farrell, Philip Mulryne, Jesse Maingot and Michael (Ronan) O Dubhghaill, who joined the novitiate last year were professed Dominicans. These Brothers will soon move on to the Dominicans’ studentate in St Saviour’s Dublin to begin their studies in philosophy and theology. Fr Gregory Carroll OP (prior provincial) presided at the profession ceremony and in his homily he reminded the newly professed Brothers that their task of becoming preachers depended on their life of prayer, study and living in community. The Irish Dominican friars have 19 men in initial formation at the beginning of the academic year 2013-14. They come from a variety of different backgrounds and professions. Among the Brothers in formation are a pharmacist, teacher, publican, nurse, engineer, accountant, lecturer and a historian. Separately, three new novices were received on 10 September into the Franciscan novitiate in Ennis friary by Minister Provincial, Hugh McKenna, OFM. Ronan Sharpley and Damian Casey for the Irish Province and Richard Cutting for the English Province begin their year as novices after completing the postulancy programme in Killarney friary. The year will be primarily devoted to prayer, a deepening of their understanding of the Franciscan life, charism and spirituality, and a continuing discernment of their vocation.